On this page you will find ideas for unique fall shower favors for a baby shower or party featuring the rich colors that represent all that we love and enjoy about the time of year known as autumn. It should come as no surprise that many of these inexpensive fall party favors place the focus on classic favorites, fall leaves in bold colors and another favorite, beautiful pumpkins of all sizes. Mini-pumpkins and perhaps a copper colored cookie cutter that comes in its own gift box tied with a ribbon and ready to give to your guests can be used both as decorations for the event and to show your appreciation when the party is over. Go here to see more leaf and pumpkin stencils that can be used to make your own fall themed place cards and gift tags. 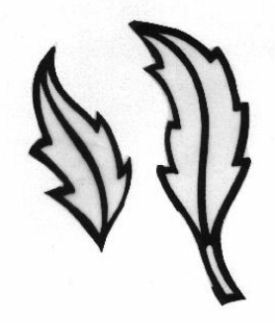 A leaf design may be drawn on a commonly used item, used to embellish a crafts project or featured in an everyday product improved by its shape like a leaf shaped bookmark. This is one of the easiest favors to make for a fall baby shower. Decorate a bookmark using a leaf template and paint or ink in fall colors. 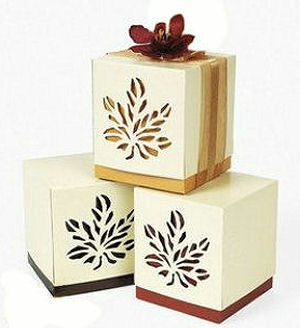 Stencil one, single leaf centered on the side of the box or scatter leaves of varying sizes and shapes for a windblown effect. Regardless of which of our fall shower favors you decide is best for your party guests; remember presentation is very important. Any goody, from homemade cookies to a few bites of chocolate candy are more special when tucked inside fall themed favor boxes that you made yourself using card stock. 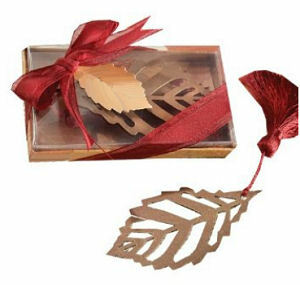 Simply stencil a fall leaf design on the side, fold them according to the template, tie with a ribbon that reflects the colors of your baby shower's theme and prepare to receive lots of compliments! Go here to see more ideas on how to use mini pumpkins as decorations and favors for a fall baby shower. Small pumpkins make lovely place card holders and guests will appreciate that they are allowed to take their personalized mini pumpkin home as a favor after the party to add to their home's autumnal decor. 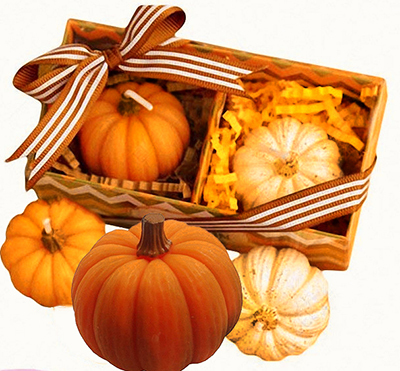 Homemade pumpkin shaped candles scented with spicy fragrances can be utilized in the same manner. Please make plans to visit Unique Baby Gear Ideas again soon to see more ideas for fall shower favors, gift ideas and more!